Shortly before his death, the Devonshire-born cleric, writer and antiquarian, Sabine Baring-Gould (1834-1924) wrote: ‘To this day I consider that the recovery of our West Country melodies has been the principal achievement of my life.’ Though there have been a number of biographies of this Victorian polymath, none has looked in detail at his role as a leading figure in the English folk song. Most of Baring-Gould’s childhood was spent travelling in Europe with his family. Away from the influences of a conventional education he explored the mythology, romances and folklore of northern Europe and took particular delight in the Icelandic sagas. He entered the church at the age of thirty and became a curate in Yorkshire where he accumulated folk tales, riddles and the first of the thousands of traditional songs he collected during his long life. He inherited the Lew Trenchard estate in Devon to become both squire and parson of this little parish. It was in 1888 that a chance remark at dinner prompted his hunt for old songs in the area around his home. From Lew Trenchard he travelled around Devon and Cornwall to meet the singers in their pubs and their cottages and to coax them to part with their old songs. He used his celebrity status as a leading novelist and writer to bring the folk songs of the West Country to a wider audience through his publications, lectures, costume concerts and the first folk opera, Red Spider, based on one of his novels and on songs he had heard. The books of songs that he published have been criticised for the way in which he edited them for publication, striking out coarse material or rewriting songs but, in doing so, he was acknowledging the limits and demands of public taste of his time. Martin Graebe has been fascinated by Baring-Gould for many years, but the re-discovery of a large quantity of his personal papers in 1992 propelled him towards a re-evaluation of Baring-Gould’s work on folk song. What he has uncovered is a fascinating collaborative project between Baring-Gould and the musicians, singers and ordinary members of the public in Devon and Cornwall. He also looks at his relationships with other folk song collectors such as Lucy Broadwood, Ralph Vaughan Williams and Cecil Sharp. This book will be of interest, not just to enthusiasts for English folk song, but also to those who wish to know more about their place in the lives of the ordinary people of the late nineteenth century. 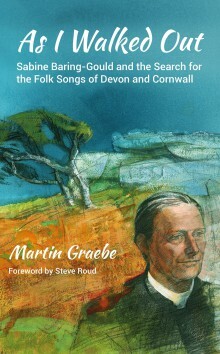 Martin Graebe researches and writes about English folk song and has been studying Sabine Baring-Gould and the song collection that he made in Devon and Cornwall for many years. He sings with his wife, Shan, and they have performed traditional songs from the collection to audiences around the world.